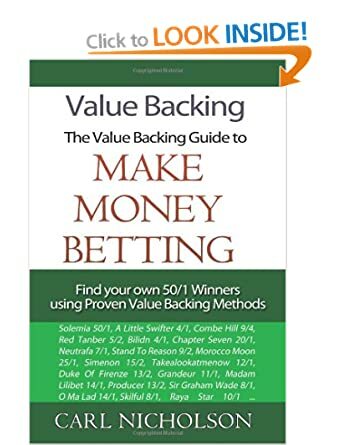 Today there is an opportunity to read Carl Nicholson's Value Backing book for free. This book tells the story of Carl's betting career from an interest at uni to working with the Daily Racing Form in the USA. It then follows that with Carl's tips and advice for finding value bets for yourself. It's a quick and easy read and will give you some food for thought. The paperback version of the book sells for £9.67 and the Kindle version sells for £7.70. But this week you can get the Kindle version for free. Amazon provide free Kindle readers for PCs & Macs as well as Ipads, tablets and lots of smart phones. So you don't need a Kindle to read this book. The book itself is rated 4 stars by the Amazon reviews and here is the blurb from the back cover. The secret to winning money from horse racing is to find value bets. You may know this from racing newspaper columns like the Racing Post Pricewise. Carl Nicholson is the brains behind the Value Backing horse racing tipping service and in this his first book he tells the story of how he learned his trade from his early days as an intern at the Daily Racing Form whilst studying at Harvard. Right up to today and his horse racing tipping service. The second part of the book details the methods that Carl uses to find the value bets that make up his service and which have earned him a reputation for big priced winners. Today I have details of changes to the Scoring For Profit football laying service. Gary started off his betting career arbing between bookies football coupons and Betfair. But when he tried to scale up his betting he found that he couldnt make enough profit from his coupons method. It was then that he created the Scoring For Profit system that involved laying in the football correct score markets. For the new season Gary has now added Both Team To Score bets to his method and to demonstrate the profitability he is offering 6 weeks free access to the service. I've just had a look and there are no bets today but there will be tomorrow. By the way yesterdays winner was from the Handicap Debutants System. I've just been reading an interview with pro punter Laurence Lambourn so I thought I'd share the highlights with you. Laurence works out his own idea of what the price of the contenders in a race should be. He then looks to bet at 30% over his idea of the true odds. Working like this allows a profit margin but also allows a percentage to cover any errors or unknowns in the calculation of the value odds in the first place. For readers who don't know where to start with creating an odds line I'll gather up some resources for another day. This is a key factor for betting success. I know people who consider themselves professional who are still swayed by a heavily backed horse or a comment from an expert on the racing channels. The thing is the crowd or the expert may be onto something but once everybody is onto something then the value is gone. So if you only bet on horses that have been gambled on you will lose over the long term! If you can get on before the gamble begins then that's a different matter. All in all I didn't glean a whole lot of info from this interview but the points I have highlighted above are the key to any betting career. And are recurring themes when talking to successful punters. Determine your own idea of a value price and don't be swayed by the public or pundits. And any strategy can be a winner if you bet at value odds.